Skoda is getting ready to launch Skoda Yeti at the 2010 Auto Expo in Geneva. It had launched its hatchback model, Skoda Fabia, at the Delhi Auto Expo 2008. 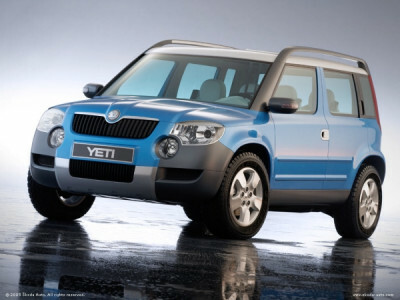 Yeti will have the same suspension, transmission and brakes as present in Skoda Fabia. The company will launch petrol and diesel models of the car. The petrol variants will range from 1.6L to 2.0L while the turbo diesel model will be 1.9L engine. Its diesel engine may also be similar to the one that marks its presence in Skoda Octavia. Skoda Yeti will compete against soon-to-be-launched Tata IndiCruz and Tata Safari, Mahindra Scorpio. The car will be imported as CKD and will be assembled at company’s Aurangabad plant. Hyundai Sonata Rebadged and Restyled!